Dominique James has posted an interesting piece on Viveza's U-Point technology. I'm also a big fan of the work going on over at Nik Software. 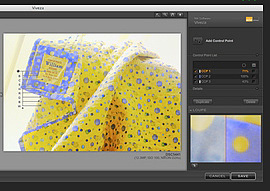 This latest plug-in for Aperture -- which is also available for Photoshop CS3 -- makes localized editing a snap. If you're not a huge fan of channels and masks in Photoshop, take a peek at what Nik is up to. It might change the way you work. Oh, and one other thing. If you buy Viveza for Photoshop, the registration number works for the Aperture plug-in too, and the other way around. It's like getting a 2 for 1. Screenshot created by Dominique James. Events! See the TDS Event Calendar for photography workshops, speaking engagements, and trade show appearances, including my Beginning Workflow with Adobe Photoshop and Lightroom on June 22-28, 2008 in Sante Fe, New Mexico.